It is a distinctly American cycle. A rampage at a school leaves scores of students dead or wounded. Aerial footage of the evacuation airs on every news network. Politicians send their “thoughts and prayers” to the victims and their families via Twitter. A candlelight vigil takes place later that same day. As weeks pass, discussion about gun control starts to slip away from the Congressional floor. The name of the school and the town fades away from national memory as another shooting will inevitably take its place. But this time is different. This time, the victims are breaking the cycle that has characterized every mass shooting of the past two decades. Survivors from Marjory Stoneman Douglas High School, where a shooting last week left 17 dead, have taken to news outlets to voice their frustration with the lack of strict gun control legislation in this country. In recent days, they have written op-eds, headlined rallies, and delivered interviews on every cable news network. They refuse to fade away from the nation’s memory. They demand to be heard. They demand change. We have often looked to politicians to guide us through tragedy after tragedy. We expect them to make a difference in our nation’s laws, to prevent gunmen from taking more sons and daughters. Yet, they have failed us. Again and again. As the teenage survivors of the Valentine’s Day shooting remind us, we can’t always look to the adults for help. It has fallen upon us, American high schoolers, to stand up for what we believe is right. It is a despicable responsibility, for the nation’s children to plead lawmakers to pass legislation to protect our lives. But it is our responsibility nevertheless. After all, it is the young survivors of the shooting that has spearheaded this current national debate. It is the 17-year-old survivors that have demanded more change than any adult politician in the past two decades. 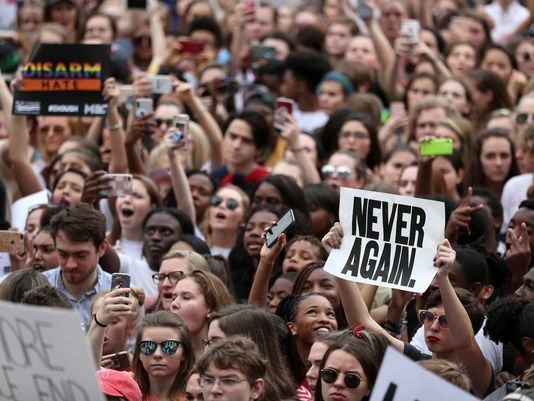 The survivors have planned days of national action for the upcoming months, where students across the country are encouraged to protest for stricter gun laws. Already, high school students from the DC area, Virginia, and Maryland have walked out of their classes the Tuesday after President’s Day to stage a protest in front of the White House. Survivors of the Florida school shooting and others marched on the following Wednesday to the state’s capitol for a rally. One of the proposed days of action is to take place on April 20th, calling for a “National School Walkout.” Senior Casey Martin has posted a link to the senior Facebook group to an online petition proposing a national walkout from school on that Friday. She captioned the link: “Maybe senior skip day could have another meaning this year.” As of the time of writing, her post has gotten over 30 likes. The graphic used for Murdock’s petition on change.org. Click on the image to be redirected to her petition. “I saw another friend of mine share it on Facebook, and I started thinking about how our school might be able to take part, and hopefully send a message to legislators who for years have been so focused on partisanship that they’ve enabled a society where gun violence is endemic,” Martin said. “We have a mandatory civics class at the school for a reason – so that we can become engaged citizens. This is us being engaged. This is us trying to make a difference,” she stated. The petition she shared was written by 15-year-old Ridgefield student Lane Murdock. According to her petition, the plan is as follows: “On Friday, April 20th, the 19th anniversary of the Columbine shooting I propose a National High School student walk out. Walk out of school, wear orange and protest online and in your communities.” Murdock’s petition, hosted on activist platform change.org, has already garnered over 179,000 signatures over the past week. As students from Darien High School, we are no strangers to the tragedy that grips a community after an act of violence. Sandy Hook, where a shooting took the lives of 26 first-graders and teachers in 2012, is only a 45-minute drive away from Darien. As a teenager growing up in the age after Columbine and Sandy Hook, the fear of a school shooter is ever-present. It is always a possibility whenever the bell rings at 7:35 every morning. We should not have to be worrying about this when we go to school. We should be worrying about our plans for prom, passing our AP exams, and getting to practice on time. Not whether the quick “I love you” we say to our parents as we rush out the door in the mornings could be our last. 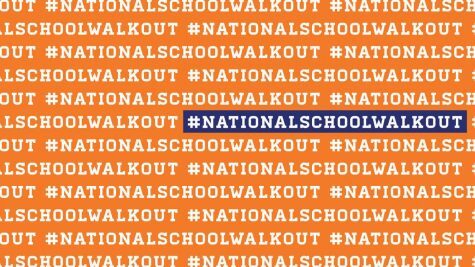 Although a walkout may not immediately change anything, we will be one school out of hundreds across the country. This show of solidarity nationwide may put the pressure needed on politicians to enact change to protect America’s children. Note: This article was written during a week when DHS was not in session. On February 26, 2018, DHS students met with members of the DPS and DHS administration and are actively working on how the DHS community will express its views on the national gun control debate.